Established in the year 1985 we, "Khandelwal Caps & Closures Pvt. Ltd.", is an ISO 9001:2000 certified organization involved in manufacturing and importing a remarkable gamut of Aluminium Caps & Sheets. 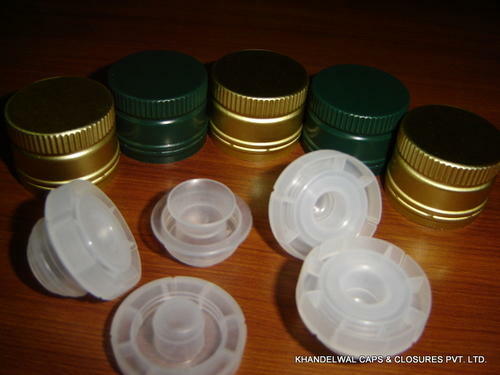 Products that this range comprises are Pilfer Proof Caps, Aluminium ROPP Caps, Barrel Type Closures, Crown Caps, Olive Oil Closure With Plastic Insert, Metal Screw Caps and Screw Bottle Caps. Along with this, we offer Tear Off Seals, Flip Off Seals, Twist off Lug Caps Screw Caps and many more. This offered range is manufactured by making use of supreme quality required basic material, procured from the accredited vendors of the industry. Furthermore, we design and develop all our products using latest moulding techniques in line with the requirements of the clients. This range is available with us in different technical specifications that can be further customized as per the requirement.